On January 29 and 30, 2019, a two-day training course on “Business Skills” was held at YSU Ijevan Branch, implemented by IAB International Academy of Business, within the framework of the “Youth Empowered” three-year program of Coca-Cola Hellenic Bottling Company. 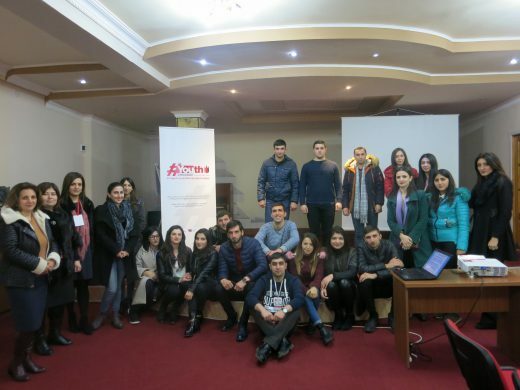 The training was attended by more than 25 young people from Tavush region including YSUIB students and graduates. The training was conducted by the Executive-director of “Madatech” David Babayan and YSUIB employees, acting Dean of the Faculty of Economics, Associate Professor of the department of General Economics, Ph.D. Gayane Avetisyan, assistant of the same department Anzhela Alexanyan, lecturers Hripsime Hayrapetyan, Arpine Yeganyan and Marietta Atabekyan, lecturer of the department of General Mathematics and Natural Sciences Slavik Alaverdyan. Slavik Alaverdyan made an opening speech. He presented “Youth Empowered” three-year program, the activity of IAB International academy of Business, “Business Skills” modules and trainers. The training was accompanied by theoretical material, questions and discussions, tests and individual assignments and group work. On the first day, “Time Management”, “Project Management” and “Business Plan” modules were implemented. The participants got acquainted with the principles of efficient use of time, Eisenhower Time Management Matrix, Project Specificity and Limitations, Lifecycle and Management Processes, WBS, Gantt Chart, SMART Business Purpose, Business Plan Design. The participants introduced with groups the events structure for their organization, compiled the Gantt chart, and completed Eisenhower matrix. At the start of the second day, firstly, Business plan module was touched upon, followed by Financial Literacy, Negotiations, and Sales Skills Modules. The market and the internal market, organization’s economic cycle, key accounting concepts, evaluation of financial results, the functions of financial means, negotiation types, stages of the negotiation process, product, customers’ motives, and the role of competitors were presented. The groups negotiated and then prepared products from the given objects and presented their peculiarities and competitive advantages. The meal break during the training was provided by “Marani” supermarket in Ijevan. During the training, Milena Hambardzumyan, a supermarket employee, presented the organization’s activities, also mentioning that they have vacancies. At the end of the training, the trainers thanked the young people for their participation and called for a thorough study of the guidelines and the program’s activities for future business ideas. The next training on “Life Skills” will take place on February 5. The photos of the training are available in the gallery.